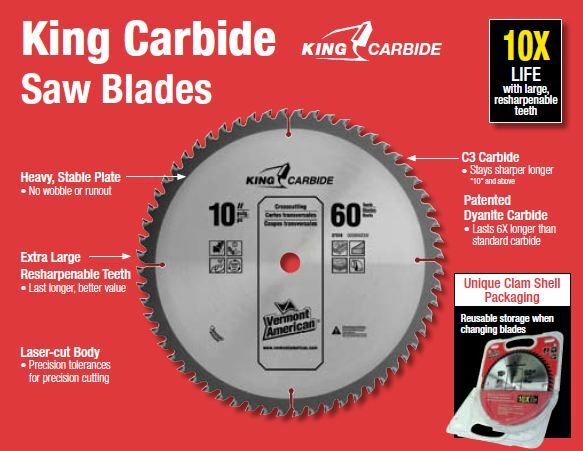 King Carbide™ Series – Ripping and crosscutting soft and hard wood, chipboard, plywood, laminated and veneered panels. Remodeling blades for nail-embedded wood. Resharpenable oversized Dyanite™ carbide teeth resist shock and last up to 5X longer than standard carbide. Thick, hardened bodies resist deflection for precise cuts. Our finest quality carbide tipped blades. Laser X2 Series Carbide Tipped – Application/Materials – Fast, clean cuts in solid wood, plywood, chipboard, and composites. Extra clean crosscutting. Laser X2™ V-ground teeth have dual cutting edges for balanced, splinter free results. XTEND Cordless Series Steel and Carbide Tipped – Ripping and crosscutting soft and hard wood. Clean cuts in plywood, plastics and veneered panels. Micro-thin kerf and extra sharp teeth provide fast, clean results and up to 40% more cuts per battery charge. Titanium Carbide Tipped – Ripping and crosscutting soft and hard wood, chipboard, plywood, plastics, and veneered panels. Titanium carbide teeth provide exceptional hardness and edge retention. Superior diamond wheel grinding yields 3X sharper edges than conventional carbide blades. Trade Duty Carbide Tipped – Ripping and crosscutting soft and hard wood, chipboard, plywood, and wood composites. Up to 60X longer life than steel blades. King Carbide™ Series for non-ferrous metal – Fast, clean cutting of aluminum, copper, and brass sheets, tubing, and extrusions. Also for laminated panels and plastics. Resharpenable oversized Dyanite™ carbide teeth with triple chip (TCG) grind for clean cuts and long life. Thick, hardened bodies resist deflection for precise cuts. Our finest quality carbide tipped blades. XTEND Cordless Series for non-ferrous metal – Fast, clean cutting of aluminum, copper, and brass sheets, tubing, and extrusions. Flat top grind (FTG) and thin kerf provide fast, clean results and up to 40% more cuts per battery charge. Trade Duty Carbide Tipped for non-ferrous metal – Fast, clean cutting of aluminum, copper, and brass sheets, tubing, and extrusions. Triple Chip (TCG) grind produces clean cuts and long life. Stacked Steel Dadoes – Cuts 1/8″ to 13/16″ wide dadoes, rabbets, splines, and lap joints in wood and wood composites. Stacked design provides flatter bottom in grooves and lap joints. Resharpenable. Dial a Groove Carbide® Tipped Dadoes – Cuts 3/16″ to 13/16″ wide dadoes, rabbets, splines, and lap joints in wood and wood composites. Durable, easy to adjust dado for general purpose woodworking applications.